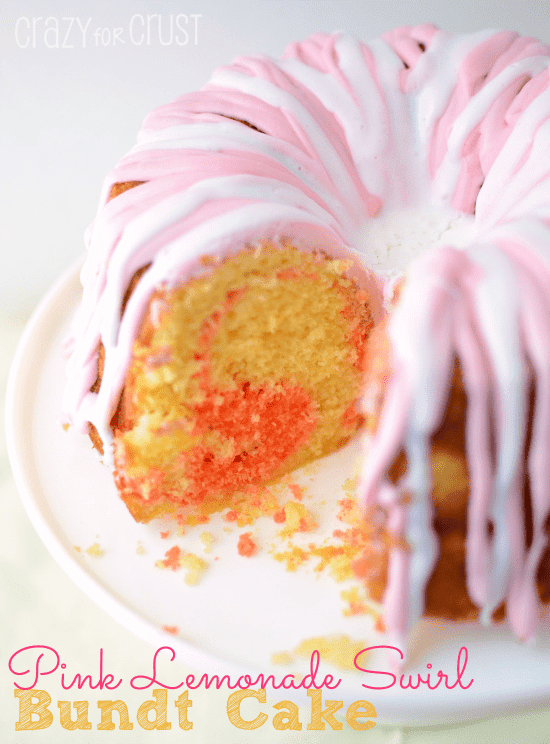 Perfect for Spring, this Pink Lemonade Swirl Bundt Cake pops with tart and sweet flavor! 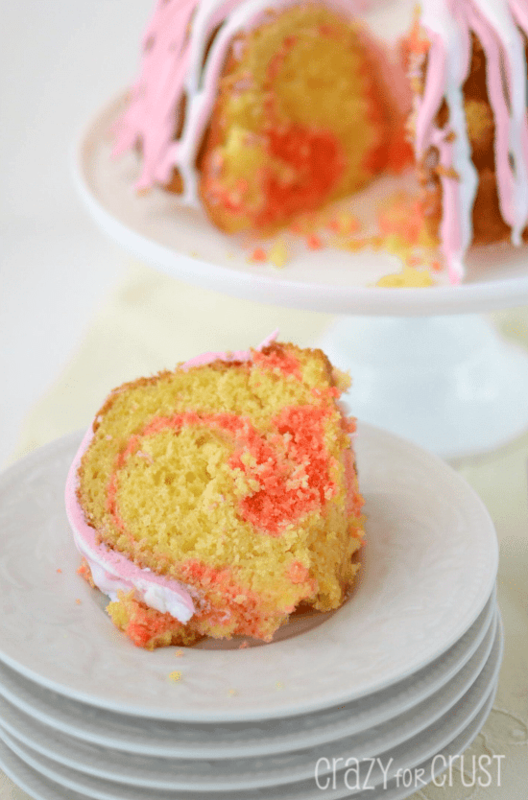 A lemon cake mix is combined with pink lemonade drink mix to create an explosion of pink lemonade flavor and color! 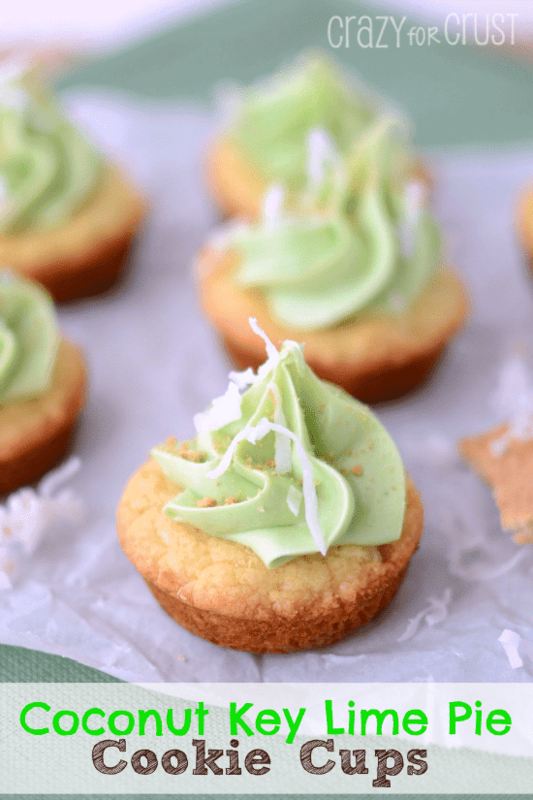 You could say I’m obsessed with the tart and sweet flavor of citrus desserts right now. Which is really weird, because until a year ago when I first tasted a Lemonade Girl Scout Cookie I hated lemon in desserts. I would not eat it AT ALL. Now? Now I can’t get enough! 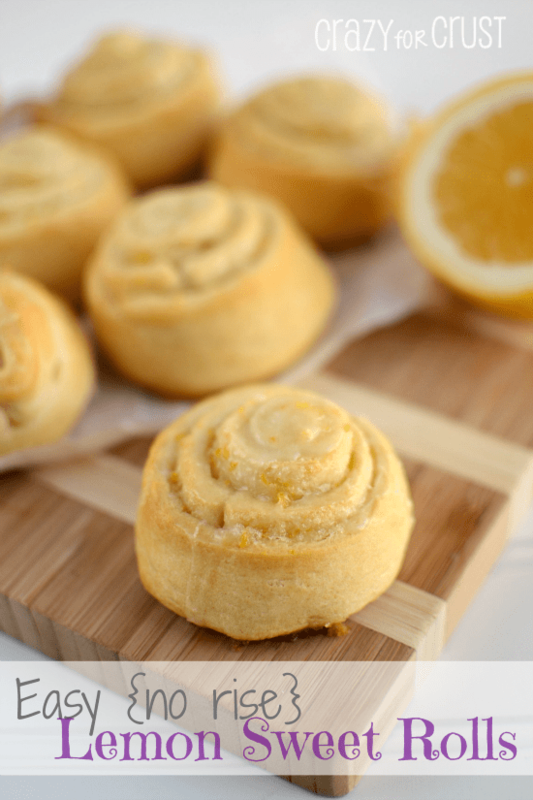 To illustrate my obsession and the fact that I probably need a Citrus 12-step Program: In the last few months I have made Lemon Pound Cake, Lemon Meringue Pie Fudge, Lemon Ice Cream, Lemon Sweet Rolls, Lemon Cake Mix Cookies, and Key Lime Pie Cookie Cups. And guess what? My fabulous mother-in-law just brought me another bag of lemons! Good, because I made you a cake. Spring-in-a-bite! Citrus reminds me of spring, and I am ready for Spring, are you? I am so looking forward to more sunshine, warmth, flip flops and short sleeved shirts. After months of wearing boots and sweaters, I’m bored of my closet. This cake is the perfect balance of tart and sweet. As soon as I saw the Pink Lemonade Frosting Creations packet, I knew I wanted to make this cake. I remembered a beautiful strawberry bundt cake that my friend Joan from Chocolate, Chocolate, and More made last year and it was so beautiful I knew I wanted to make my own version of it someday. Seriously, this is probably the easiest cake I’ve ever made. I used a Lemon Cake Mix and reserved 1 cup of the batter, into which you mix some pink lemonade mix. Half of the remaining cake mix goes in the bottom of your bundt pan. Top that with the pink lemonade cake batter, then top the whole thing with the rest of your lemon cake batter. 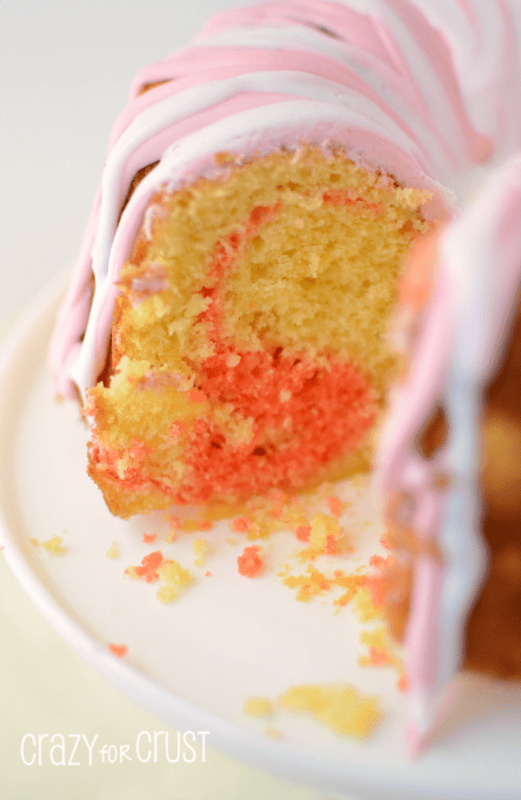 Bake it up and you get a gorgeous swirl of neon pink in the center of your cake! Then: time for frosting. Did you know that you can melt canned frosting to pouring consistency? I don’t remember where I got that tip from, but it was the best tip ever! Reserve a little white frosting from your can, and mix more pink lemonade mix into the remaining. Heat each for a few seconds in the microwave (no more than 30 seconds, probably less!) and pour into a sandwich baggie. Cut of the corner and pipe onto your cake. I love this firecracker pattern, but you can do it however you want! Once the cake chills a little bit, the frosting hardens up back to it’s normal consistency, perfect for serving. It’s really a genius way to frost a cake. I ate way more of this than I should have. But in my defense, it was SO good. I could have eaten all of it if I didn’t give slices away to my friends. I’m like one of those guys that sneaks up to people on the city streets, “hey you wanna buy a watch?” and opens his trench coat. Except, my trench is hot pink and has racks of cake and cookies inside, so way better. Hey, you wanna buy a piece of Spring? Make this cake! 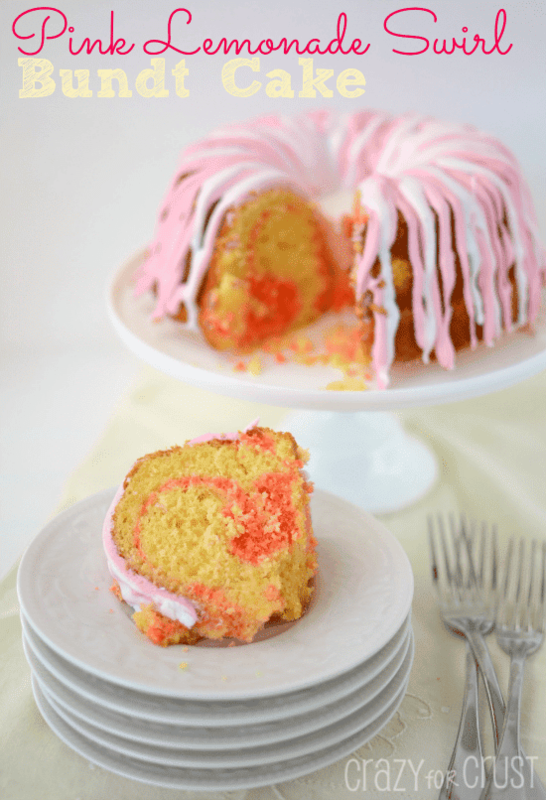 This Pink Lemonade Swirl Bundt Cake is made using a cake mix so it's super easy! Mix in some powdered drink mix for a fun flavor pop. Mix cake mix, eggs, oil, and water according to package directions. Pour 1 cup of batter into a measuring cup. Stir in 1 tablespoon pink lemonade drink mix. If the color is not bright enough for you, add a few drops of red food coloring. Place half of remaining lemon cake batter in the bottom of your bundt pan. Carefully pour the pink lemonade batter evenly over the top, and then pour the remaining lemon cake over the pink lemonade batter. Bake 38-40 minutes, until a toothpick at the edge comes out clean. Cool completely before removing from pan. Once cool, remove cake to a serving plate. I like to take three strips of wax paper and place them under the edges of the cake so that after frosting, once the wax paper is removed, the plate is clean. Open the can of frosting. Place 1/4 cup of it in a small microwave safe bowl. Set aside for the moment. Stir the remaining pink lemonade mix into the can of frosting. Remove spoon and foil, and heat in the microwave for 30 seconds. Stir, and place in a ziploc sandwich bag. Seal the bag, all but 1/2” at one end, and cut off the opposite tip. Pipe over cake in a firecracker type pattern. Heat reserved white frosting for 10-15 seconds in the microwave. Place in its own ziploc sandwich bag and repeat the drizzle process. Chill until set before cutting. Hey Dorothy! Do you happen to know if I can purchase the pink lemonade flavor creation all year long or is it seasonal? I would love to make this cake for Olivia’s birthday this weekend! I think it’s seasonal, but you can use Kool-Aid or a pink lemonade drink mix! I think the packet is a few tablespoons. I’d add 1-2 tablespoons and then taste to see if it’s strong enough for your liking! Happy birthday to her! Pingback: 50 Bundt Pan Recipes - Chocolate Chocolate and More! Want to make this, but no longer can find the Creations …. they must have discontinued them. I know you said drink mix would work, how about jello???? Yes, I think Jell-O would work, do they have a pink lemonade version? Or a lemon would be good too! I would use about 1 small package (I think they are 3 ounces). 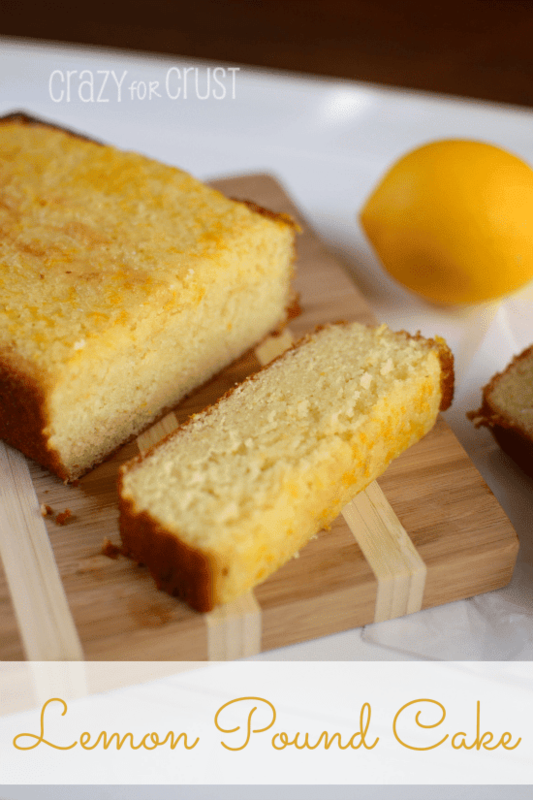 Pingback: Fun Recipes with Lemonade!